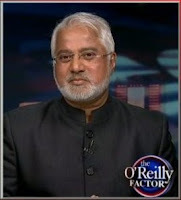 Mike Ghouse on O’Reilly Factor, Fox News tonight with Laura Ingram at 8:00 PM EST about the offensive poster. ‘Offensive to Muslims’: Mike Ghouse and Dem congressman Jim McDermott calls on FBI to take down photos of terrorists. Mike Ghouse to FBI – “Robert Mueller, take that poster down”First of all, as a society, we have a responsibility to keep law and order and faithfully guard the safety of every citizen. Hate is one of the many sources of disrupting the peace in a society and it is our duty to track down the source of such hate and mitigate the conflicts and nurture goodwill. FBI routinely posts the pictures of the wanted terrorists in the post offices and public places, and even displayed on TV networks – so, if people spot them, they can report. Look at the stupidity of FBI – these terrorists are not in America, how will an American ever spot these dudes? That ad should be posted in Yemen, Saudi Arabia and Afghanistan, not here in America. That is waste of tax payer dollars. The 2nd Mistake is. Terrorists come in all colors, religions and races – to place the Muslim ones exclusively is damn stereotyping and a cause of hatred and disruption. This ad has got to go. No American has to live in tension, apprehensions and fear of the other, that is the kind of cohesive America we want to build. I had warned Fox news right here on September 23 and again on October 8, in two different appearances (http://www.myfoxphoenix.com/story/19631912/2012/09/25/controversial-anti-muslim-ad) that the posters in the New York subway by Pamela Geller was dangerous to fellow Americans, particularly Muslim women wearing a scarf, Catholic women coming from a Church, Sikh Women, the older Hindu women with part of the Saree covering their head, the Non-Muslim women from Africa donning their cultural headdress. Does the city have a role in imbuing a sense of security in her people, or each citizen is on his or her own? Did you know a Hindu man was killed on the subway on mistaken Identity, is the security of that person means nothing? Who is responsible for the death of that individual? I am proud of Congressman, Jim McDermott from Washington State to work against stereotyping any one. McDermott, a Democrat from Washington state, voiced his “deep concern” about the ad, which shows mug shots of international terrorists, and asked the FBI chief to “reconsider publicizing” it. Mike Ghouse is a speaker, thinker and a writer on pluralism, politics, peace, Islam, Israel,India, interfaith, and cohesion at work place. He is committed to building a Cohesive Americaand offers pluralistic solutions on issues of the day at www.TheGhousediary.com. He believes in Standing up for others and has done that throughout his life as an activist. Mike has a presence on national and local TV, Radio and Print Media. He is a frequent guest on Sean Hannity show on Fox TV, and a commentator on national radio networks, he contributes weekly to the Texas Faith Column at Dallas Morning News; fortnightly at Huffington post; and several other periodicals across the world. His personal site www.MikeGhouse.net indexes all his work through many links.